that college basketball is only two and a half months away. universities by winning conference championships and plenty of national championships in basketball and let football be a warm-up for the hoops season. Oh my how the times have changed. 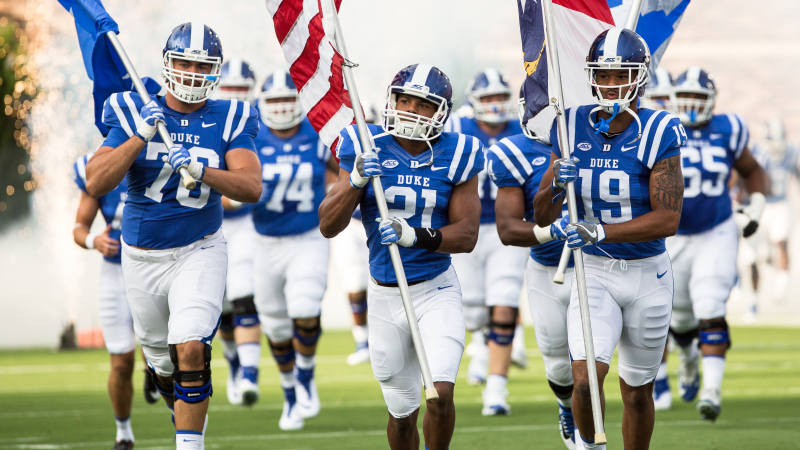 Now, a trip to Tobacco Road is not an easy experience for a visiting football team. his time at Duke which is amazing considering Duke was 10-82 the previous 8 seasons. against teams from within the state of North Carolina (from September 15, 2012 – November 25, 2017), topping N.C. Central and Wake Forest five times, North Carolina four times and N.C.
State and Elon once. Two of the three losses have been to the Tar Heels, on November 20, 2014, and November 7, 2015. 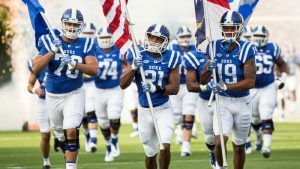 Duke also dropped a 24-14 decision to Wake Forest on September 10, 2016.
more yards of total offense. The Deacons had 512 total offense yards (298 rushing, 214 passing) against Boston College last week. quarterbacks in the season-opener than Wake Forest. Sam Hartman became just the fourth opening day starter over the past nine seasons for the Deacons. Only Troy has fewer opening day starters than Wake Forest. just about any college team in the country. weeks, four Wolfpack alumni were the quarterbacks for their respective teams: Mike Glennon (Chicago Bears), Philip Rivers (Los Angeles Chargers), Russell Wilson (Seattle Seahawks) and Jacoby Brissett (Indianapolis Colts). Testeverde), Michigan (2004 with Tom Brady, Brian Griese, Chad Henne and John Navarre) and USC (2009 with Matt Leinart, Matt Cassell, Carson Palmer and Mark Sanchez) as the only school ever to have four alumni starting at quarterback in the same NFL season. beating Michigan at the Big House 34-32 in 2007. -15 including a narrow 45-38 OT loss at Penn State this season and has a sparkling 27-5 record versus Sun Belt competition. The Mountaineers are coming off of back to back Sun Belt championships and had a convincing 34-0 shutout win over MAC champion Toledo. only by Alabama (44-3), Clemson (43-4), Ohio State (42-5), Oklahoma (39-8) and Wisconsin (38-9). App State is the only program with a bowl win in each of its first three years after the complete FBS transition. It beat Ohio 31-29 in the 2015 Camellia Bowl, Toledo 31-28 in the 2016 Camellia Bowl and Toledo again 34-0 in the 2017 Dollar General Bowl. with at least 10 completions and no incompletions. Charlotte showed during its game with the Mountaineers that it is still a long way from being a successful FBS program, as the 49ers were outclassed in every aspect of play. show more promise by knocking off Old Dominion in their Conference USA opener the following week. Rod Broadway built the Aggies into a national power and capped off a perfect 12-0 season with a 21-14 Celebration Bowl win in Atlanta over Grambling. Broadway retired from coaching after that perfect season. the next week downed the North Carolina Tar Heels 42-19. College Football is alive and well on Tobacco Road… Thank you very much!! players suspended for breaking NCAA rules violations are reinstated.